Description (Goodreads):- Finding your dream home is difficult enough, but what if you found it and then discovered it was haunted? Medium Camilla Armstrong is led to the beautiful Rosehill country estate after communication with her deceased grandmother. On first inspection she senses tranquillity within the house; the gentle atmosphere of a Georgian manor that is crying out for new life. 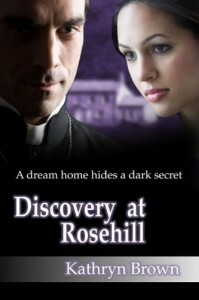 But when she moves in, Camilla discovers the house contains a dark secret, one which is to change her life forever. When The Reverend Marcus Calloway introduces himself to her, a friendship develops and Camilla realises she could at last have found her true love. But all is not what it seems when further spirit contact confirms that Marcus harbours a guilty secret.Spirit communication, manifestations and an eerie atmosphere all add to Camilla’s new surroundings as she tries hard to decipher mixed messages and a life she never knew existed. An open mind is all she asks for as her relationship with Marcus grows and the secrets of Rosehill are discovered with help from her relatives of a world beyond our own. Review:- Camila is a medium who is drawn to Rosehill Country Estate by her deceased Grandmother. The house needs a lot of work done to it both on the surface and the ghostly goings on. Camila finds it difficult to fit in with the country life style and befriends the local Vicar, whom is called Marcus, which develops into being a little more than just friends. Does he believe in what she does? Can their relationship work? He is a man with a secret of his own. The characters are believable and the romance that runs through the pages, flows nicely along. There are so many twists and turns, it will keep your gripped until the end. This book is a thrilling read, which will keep you turning those pages. There are so many emotions you will feel from reading this book, heartache, love, hope, despair, to name but a few. What are you waiting for head over to Kathryn’s site to buy or head to Amazon direct. This is my own copy of my book, I wanted to share my review with you.